Which would you choose, the green or purple basil? I choose the purple every time. Not only is purple basil more alluring with its rich, regal purple leaves, but it's also more robust in flavor. And it's more fun to say. Come on, say it: purple basil. See what I mean? There's no better time to enjoy purple basil than late summer and early fall. Whether you grow it in your garden or buy it at your farmers' market, you can use purple basil just as you would green basil in pestos, pastas, salads, sandwiches, vegetable sautes, stir-fries, soups, and drinks. Just remember to use less since it's more assertive than green basil. So next time you've got the choice, go with purple basil. You'll smile all the way to your kitchen. Purple basil is an intensely flavorful and colorful variety of basil. It's available at farmers' markets and some specialty grocery stores. If you can't find it, then substitute equal amounts of Thai basil or a larger amount of regular green basil. 1. Bring a medium pot of water to a boil. Cook orzo according to package directions until al dente. Drain. 2. In a large skillet over medium-high heat, warm the olive oil. Add garlic, stirring about 1 minute, until fragrant. Add shrimp, and cook until they turn bright red and the meat is opaque. Add zucchini and cook about 5 minutes, until softened and lightly browned in spots. Add wine and lemon juice, and lower the heat to medium. Add lemon zest, tomatoes, and salt and pepper. Taste it, and adjust seasonings as necessary. Add to the cooked orzo and toss well. Gently stir in the purple basil saving a few of the slices for garnish. Variation: Use chicken or tofu in place of the shrimp. No matter what color the basil was, I would gobble this up! I've been a purple basil convert/fanatic since the first itme I used it last summer! This orzo salad looks incredibly tasty! Your orzo dish sounds really delicious and easy to make. Gorgeous! I love shrimp with orzo (Ina Garten's recipe is my favorite) but the purple basil does indeed sound fun and look beautiful! 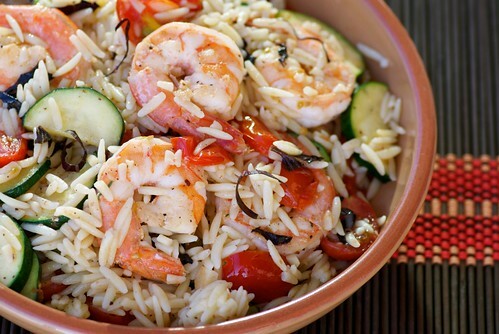 I love orzo salads w/ shrimp.....so summery. My opal basil plant is beautiful and I use it only for garnish, I prefer the stronger taste of the green basil, but next time I will mix the two together! what a gorgeous summer dish! Oooh purple basil! I've never tried it but always wanted to, it looks so much more fun! Mouthwatering recipe thanks for sharing. joanne-Thanks. It has that effect on people. stacey- I love the idea of mixing the two together. You make a good point since purple basil is more assertive than green. Thanks! bee-It's definitely worth hunting for! Kicking myself for not grabbing that bag of Orzo at the market yesterday... have everything else (well, just lowly green basil!). Green, of course. Gosh, I haven't made orzo is something like fifteen years. *Makes mental note to cook orzo." "Rhode Island is so small, they probably don't even use license plates for cars." Ya want me to go throw a Mr. Potato head at him or somethin'? I've never cooked with purple basil. It looks gorgeous- - so striking. That shrimp! That looks so delicious! I do love purple basil and grow it in my garden. sara-You're forgiven. ;) Try it with quinoa or another small pasta if you'd like. As for the orzo, my husband loves it, so I always have a bag on hand. karina-You'll be delighted when you try it. I'm sure you can find it at the SM farmers' market. magicofspice-Oh, wonderful! Then you can enjoy its brilliance any time. Purple basil is just so darn pretty to look at and can imagine how good it must taste in this pretty salad. ccanuck-Isn't it though? It just makes me smile! i have not tried purple basil~will look for it and certainly give it a try!